The summit will include a community engaged poster session where UTSA students and faculty will showcase their community-engaged projects. (Feb. 11, 2019) -- UTSA students, faculty and staff will join members of the San Antonio community to explore civic engagement ideas during the fourth annual Civic Engagement Summit. 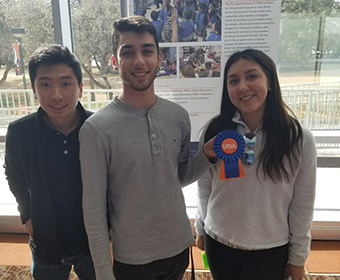 Hosted by the UTSA Center for Civic Engagement, the free summit runs from 9 a.m. to 4 p.m. on Tuesday, Feb. 12 in the H-E-B Student Union Ballrooms (HSU 1.104/1.106) on the UTSA Main Campus and includes panel discussions, workshops and dialogue about San Antonio’s and UTSA’s civic engagement impact. The 2019 Annual Civic Engagement Summit fosters a creative space for dialogue, capacity building and the strengthening of community partnerships for collective design and impact. This year’s theme is “Transforming my Empowerment into Community Action.” Speakers will share their experiences of working in the public sector. Preparing tomorrow’s civic leaders is a priority for UTSA as it strives to be an exemplary urban serving university of excellence in support of President Taylor Eighmy’s vision for UTSA. “Working with the community can better prepare our students to be the civic leaders of tomorrow, and creates the opportunity for them to weave their educational experience at UTSA with experiential community-engaged learning experiences,” said Heather Shipley, vice provost for academic affairs and dean of University College. The summit will open with a panel discussion from members of local organizations that are making a difference in the community. Panelists include 2019 San Antonio Peace Laurette Patricia Castillo, P.E.A.C.E. Initiative; Brad Mayhar, Salvation Army; Graciela Sanchez, Esperanza Peace and Justice Center; and Pamela Riles, The DoSeum. UTSA communications student Jareed Max Edmon’s workshop on the importance of oral history and community engagement. Those interested in participating in a CivicTech focus group can attend a CityFlag session led by co-founder Alberto Gomez. He is part of the team that developed the City of San Antonio 311SA application that connects residents with city departments to report non-emergency issues and promotes civic engagement using technology. Rogelio Saenz, endowed professorship in the UTSA College of Public Policy, will moderate the Civic Engagement Summit luncheon with featured keynote speaker Jordana Barton, a champion in the area of community development finance, financial literacy and digital inclusion. Barton is the senior advisor at the Federal Reserve Bank of Dallas and the recipient of the Federal Policy Champion Award by the Coalition for Local Internet Choice and the Community Broadband Hero of the Year. The summit will also include a community engaged poster session where UTSA students and faculty will showcase their community-engaged projects. To celebrate the university’s 50th anniversary, UTSA Libraries will host an exhibit to share iconic civic moments of the past 50 years in the H-E-B Student Union Galleria located outside the ballroom doors. UTSA students serve more than 10,000 community impact hours a year in a wide variety of causes such as community building, working with children and youth services, advocacy, education, poverty, food insecurity and other areas. Learn more about the Civic Engagement Summit. Get engaged with the UTSA Center for Civic Engagement. For more information, contact Maria Alejandro, director of the UTSA Center for Civic Engagement.